Listen to the record below, please share it if you like it, comment, reach out to SeeS personally. Its important those who are feeling this record get involved. Lets make this record the biggest one yet from CT Corporate Takeover!! THANKS TO THE MAJOR BLOGS AND RADIO STATIONS CURRENTLY SUPPORTING THIS RECORD!! 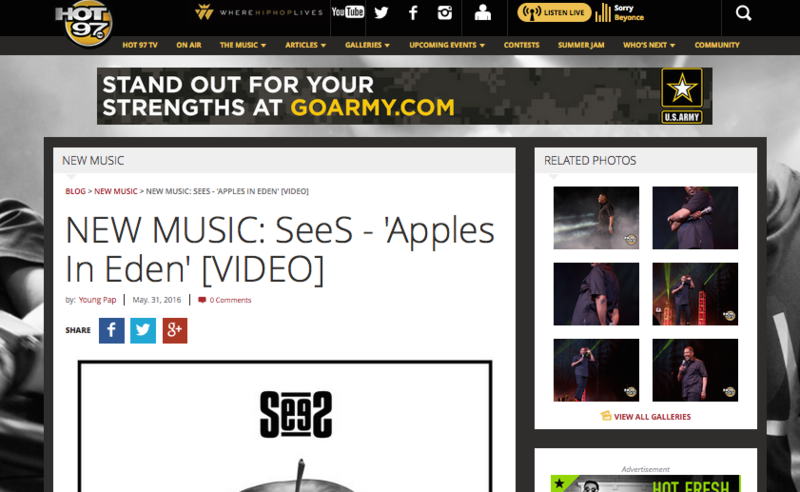 Special thanks to Hot 93.7 (WZMX), Jammin 107.7 (WWRX), and 94.9 (KMXZ) for playing “Apples In Eden” On Air!!! The video is meant to take his fans through a journey inside of themselves to address lies and deceptions “they” want you to believe. 1) The Case with Apple Phones against the Gov unlocking the Iphone without user consent. 2) The recent revelations by Samsung about Smart TV’s technology and Privacy issues. 3) The bias we see in mainstream media in America. The propaganda they push, especially when it comes to dividing people and baiting a race war in this country. 4) The inability many in the status quo have with acknowledging the injustice this country was built on; and at who’s expense their ancestors acquired wealth and power. 5) How obvious ingrained and institutionalized discrimination is in America, yet many people ignore it and act color blind to the facts. APPLES IN EDEN, WHY YOU KEEP EATING THEM?